I have been toting this cork board around for years, it's a relic from younger days, which I just couldn't seem to toss. So I shuffled it from place to place, always with the idea that I would use it...sometime. Well, today was the day! I had some notices for upcoming events that I wanted to put somewhere I would see them and be reminded. I peeked through my fabric stash and found a nice bit of denim to cover the faded glory of the the old cork. It was easy enough to tack in place with my staple gun. If I want to in the future, I can easily remove the denim and use it for something else. For now it has refreshed my old cork board. I used a length of purple polka-doted ribbon for a hanger. The glass worked hat pins are remnants from messing around when I was making beads one day, they make excellent and festive push pins too! I have hot glued tacks to the back of some of my favorite souvenir buttons, they will get much more use on my bulletin board! We all buy these, but how often to we actually wear them? I think this is a good way to recycle them and it's a nice reminder of a special event...now, where's that old Huey Lewis Pin??? 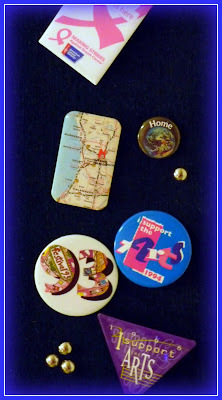 I have a little stash of tack pins from work events and fund raisers, those will end up on the bulletin board as well. 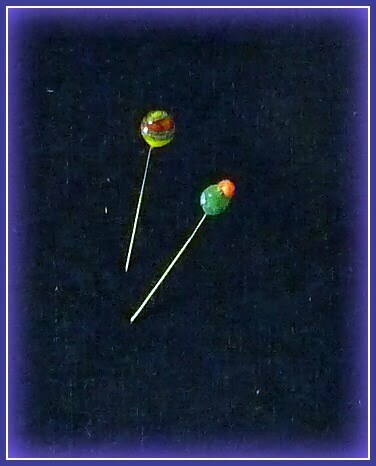 I have some left over upholstery tacks being used as push pins here too, they are also nice for hanging pictures. I use them all the time for hanging those little pictures/objects where the nail would otherwise show. So there, you go, lots of renewed and refreshed items, and a bit of a walk down memory lane as I recall how these little bits of memorabilia came into my hands. 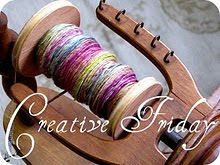 I snuck an extra little post this week, but I've got lots of fiber goodies to share with you on Friday, see you then! 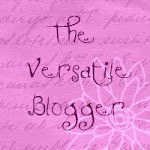 I hope you will share your ideas for renewing, recycling and upcycling, I love that kind of stuff, don't you? I hope your week is going wonderfully! Blessings friends! Love the push pin beads. Very nice touch. So you weren't up to fiber today? LOL, I'm always up to something fibery! The great thing about this little re-do, is that it only took about half and hour. I actually spent more time looking for some flowers I had cut out of colored denim, which I thought would look nice on this...I put them in a safe spot...too safe! That's great, it is always nice to reuse something you've got stashed around. 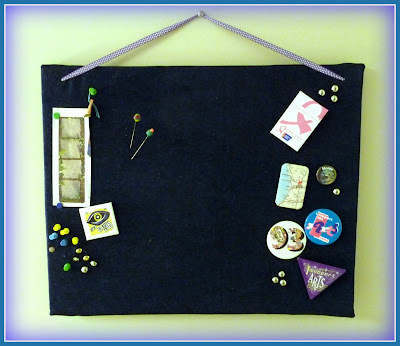 I've been wanting to make a board like this for ages......now I'll wait even longer until after the move. Thanks for sharing! Great idea, love it. I have one of those some place, makes me want to go hunt for it. It is wonderful how things just come to be from creativity.